UGC Building at ITO in New Delhi. EXPRESS PHOTO BY PRAVEEN KHANNA 05 02 2018. The Cabinet on Thursday cleared an ordinance to change the formula for implementing reservations in teaching posts in universities. The ordinance seeks to bring back the older system of taking the entire college/university as the unit for implementing reservations (the so-called ‘200-point roster’), rather than the individual department (’13-point roster’ system), as prescribed by the Allahabad High Court and the Supreme Court. Following protests by students’ and teachers’ bodies, including a countrywide march Tuesday to demand the restoration of the old system, Human Resource Development Minister Prakash Javadekar had said that the Centre would bring an ordinance to restore the 200-point system “in two days”. What is the controversy over the manner of implementation of the SC/ST/OBC quota in university teaching jobs? What is the key question in this matter, and what impact is the change from the 200-point roster to the 13-point one and back, likely to have? The matter of Vivekanand Tiwari & Anr v Union of India and Ors (April 7, 2017) in Allahabad High Court dealt with the recruitment of teachers in Banaras Hindu University (BHU), a central educational institution. The petitioners sought cancellation of the recruitment drive and a fresh beginning, treating each department of the university as the unit for calculating the number of faculty posts reserved for SCs, STs and OBCs. At that time, the number of SC, ST, and OBC faculty positions were calculated by treating the university as a unit. Thus, all posts of the same grade (such as assistant professor) across departments in a university were grouped together to calculate the quota. This was in keeping with the directions of the University Grants Commission (UGC). The Division Bench of Justices Vikram Nath and Daya Shankar Tripathi upheld the petitioners’ plea and criticised the UGC for applying reservation in teaching jobs in a “blanket manner”. “If the University is taken as a ‘Unit’ for every level of teaching and applying the roster, it could result in some departments/subjects having all reserved candidates and some having only unreserved candidates. (This) would be discriminatory and unreasonable (and)… violative of Article 14 and 16,” the court said. The High Court quashed Clauses 6(c) and 8(a)(v) of the guidelines framed by the UGC in 2006, and the letter of the UGC dated February 19, 2008. Clause 6(c) forbade “the practice of creating department-wise cadres, which tends to create single posts or cadres with artificially reduced number of posts in order to avoid reservation”. Clause 8(a)(v) called for implementation of the roster system as per the directions of the Supreme Court in R K Sabharwal and Ors vs State of Punjab and Ors (February 10, 1995), in which a five-judge Constitution Bench had ruled that reservation rosters in government services should be with reference to posts, and not vacancies. The roster, it said, would be implemented in the form of a running account from year to year. The Allahabad HC decision was upheld by a Supreme Court Vacation Bench of Justices R K Agrawal and Sanjay Kishan Kaul in June 2017. The UGC was left with no choice. Its Standing Committee examined 10 court judgments on the subject and recommended to the HRD Ministry that the High Court’s verdict should be applied to all universities. The Ministry, after consulting the Law Ministry and the Department of Personnel and Training, communicated its go-ahead in March 2018. On March 5, 2018, UGC notified amendments to its 2006 guidelines. Following widespread controversy over the UGC’s order, the HRD Ministry moved a Special Leave Petition before the Supreme Court in April 2018, challenging the Allahabad HC order. This challenge was dismissed on January 22 this year. The clamour for an ordinance increased after that. Reservation based on department or subject as unit means the number of reserved posts at the level of, say, assistant professor, will be determined separately for each department — based on the total assistant professor posts in each department. Therefore, a department that has only one professor cannot have reserved posts — which will have the effect of drastically reducing the number of SC, ST, and OBC teachers in higher education. Under the old (200-point) formula, posts of professors across different departments were clubbed together, and there was a better chance of positions being set aside for SCs, STs, and OBCs. Also, under the new formula, departments with two or more faculty posts, but fewer than 15 in a cadre, will have only one reserved for an SC candidate at serial number 7, and for an ST candidate at serial number 14. So, if a department has only six associate professor-level posts, none will be reserved for SC and ST candidates. Reservation will only be implemented by rotation, which experts say could take years. The representation of SCs, STs, and OBCs among teachers in higher education is already abysmal. According to a government report in 2016, only seven of every 100 teachers in colleges and universities were from the disadvantaged sections. For example, only 1.02 lakh (or 7.22%) of the 14.1 lakh teachers in 716 universities and 38,056 colleges across the country were Dalits. The tribal faculty was just 30,000, or 2.12%. Under the new formula, experts say, the representation will only worsen. 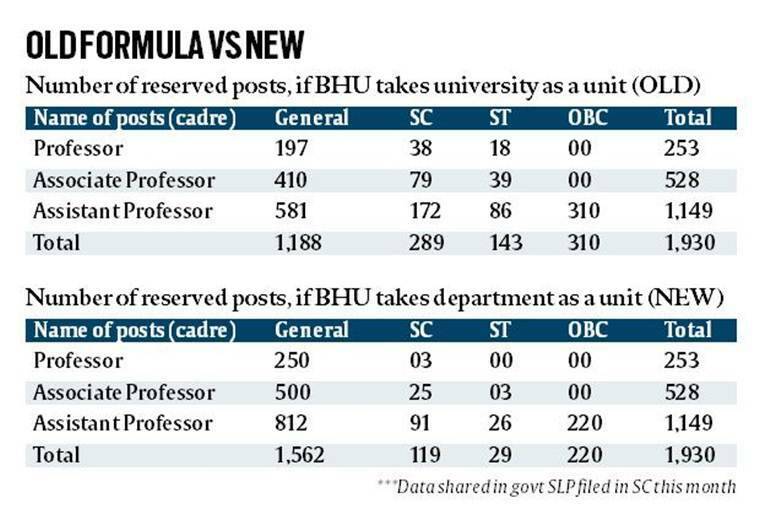 A projection presented by BHU to the HRD Ministry last year showed that if the university were to use the new (13-point) formula, the posts reserved for SCs would be reduced by half, those for STs by almost 80%, and those for OBC teachers by 30%. The government used this projection in its SLP before the Supreme Court, and argued that the Allahabad HC judgment “drastically reduces, and, in many departments completely wipes out, the representation of members of SC/ST community”. According to data compiled by the Ministry of Social Justice and Empowerment on teaching posts generated across several universities since the UGC order of March 2018, of the 706 vacancies advertised by 11 central universities, only 2.5% posts were for SCs and none for STs. It is to change this situation that the present ordinance has been brought.